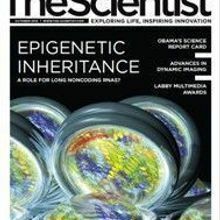 Epigenetic changes accrued over an organism’s lifetime may leave a permanent heritable mark on the genome, through the help of long noncoding RNAs. Cooperation, not competition, is the way forward. Cockfighting and other cultural practices in Southeast Asia could greatly aid the spread of deadly diseases like bird flu. A 10-year-old boy spends his summer vacation helping his chemist dad solve the structure of complicated materials. Laboratory-raised populations of dung beetles reveal a mother's extragenetic influence on the physiques of her sons. Researchers and conscientious citizens must unite against the partisan rancor in American politics and restore the role of scientific information in policymaking. Mass spec plus novel software equals dynamic views into the chemical lives of microbes. A new assay shows that cells use lamellipodia as their primary mechanism to seal up holes in epithelial tissue. Researchers reveal a new pathway of synaptic modulation in the hippocampus exclusive to females. An HIV drug can bind to and alter the function of an immune molecule, causing a dangerous reaction in patients with a particular allele. Advances in light microscopy allow the mapping of cell migration during embryogenesis and capture dynamic processes at the cellular level. The biological and social ramifications of skin pigmentation are too often ignored by scientists, teachers, and the general public. Check out image finalists and winners, as well as other memorable submissions to this year’s Labby Multimedia Awards. Meet some of the people featured in the October 2012 issue of The Scientist. Check out other memorable images and videos that were submitted to this year’s Labby Multimedia Awards.